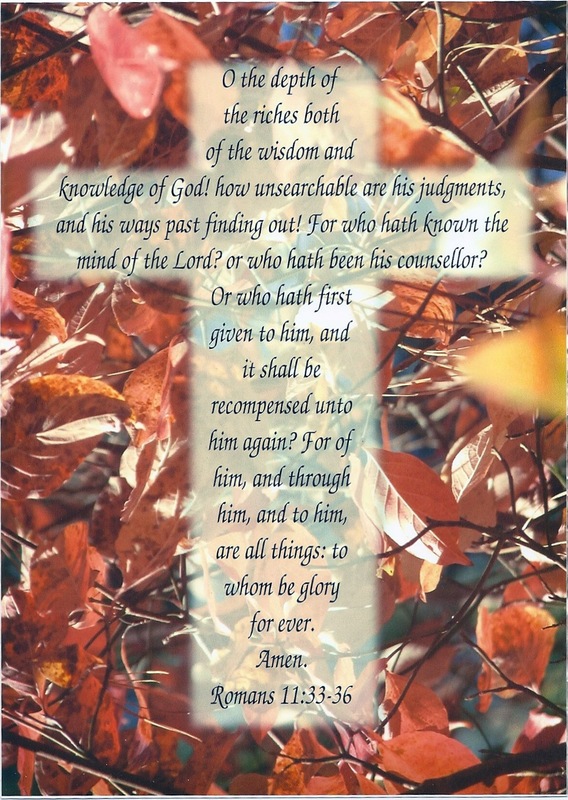 O The Depths of the Riches of God – God's Grace ~ God's Glory! What a blessing it is to sit under the preaching of the word of God, especially these last several weeks, as we have heard about the power of the gospel that saves God’s people. Paul’s letter to the Romans is not easy to understand; and so, much of the riches of God’s wisdom and knowledge are lost. But, I have come to the end of chapter 11 with a better understanding than I had before hearing it preached. The preaching of the word rooted in the new heart brings us to new awareness and desire to know; and the Spirit leads us to plunge into the depths of that which He still wants us to know. If all we experience is a “tickling of the ears” we will never know, or grow. It is when our own beliefs are challenged that we seek more of the riches of God’s wisdom and knowledge. Paul’s presentation of the power of God in the gospel to save His people is brought to an end in Romans 11. He has made known this wisdom of how God planned to save and does save His people of every nation. His explanation and exclamation end with all glory to God. Beginning in chapter 12 we will see the response of all people who are brought under the power of the gospel through faith unto salvation ~ the obedience of faith. Briefly summing up, Paul has shown us how God at first chose a people, the people of Israel, through which He would save His elect from all nations. He could have chosen any other nationality, but He chose and made the Jews a special people for the purpose of revealing Himself and executing His plan of salvation. We see from Paul’s writing ~ himself being a Jew ~ that there is a remnant of the nation of Israel that are elect; just as there are some of every nation who are elect. He makes it very clear that not all of the nation of Israel will be saved. Whether we understand his meaning to be contemporary or for all time, we must let the text explain his meaning. Romans 11:2 “God hath not cast away his people which he foreknew.” In Romans 8:29 Paul speaks of those whom God “forknew.” The Jews are not set apart, but included in this category. “For just as you were at one time disobedient to God but now have received mercy because of their disobedience, so they too have now been disobedient in order that by the mercy shown to you they also may now receive mercy. Gracious Father in heaven, we are not able in our own power to approach your throne of grace, nor do we merit your mercy, but we come at the invitation and initiation of your Son, Jesus Christ, on the authority of your word and the power of your Spirit, as sinners saved by your grace. We thank you and praise you for the riches of your wisdom, the knowledge that is bestowed upon us, in us and through us, that brings us to you and keeps us until the day of redemption. What a glorious day that will be to see the height of your glory revealed to us who are in Christ. In His name we thank you and praise you. Amen.